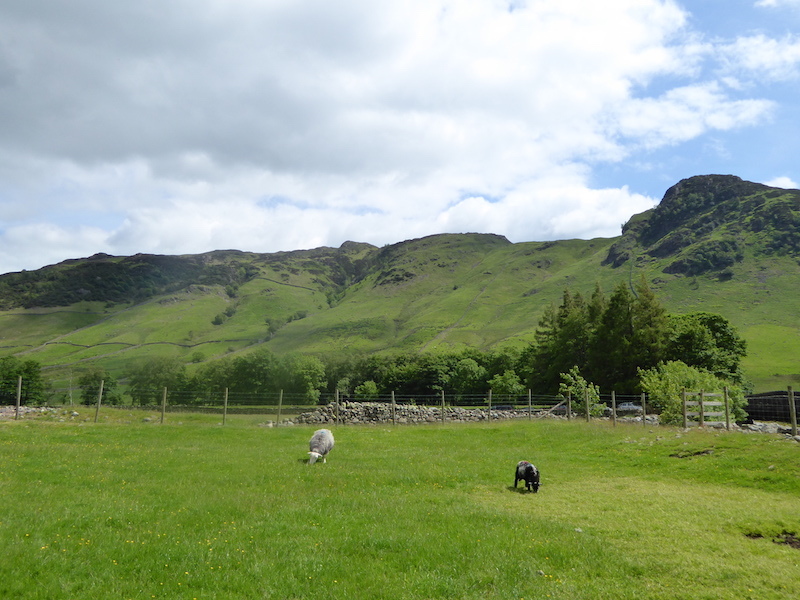 The forecast indicated a dry day with sunny spells later on in the afternoon, so we drove over to Elterwater to walk through the Little and Great Langdale valleys. 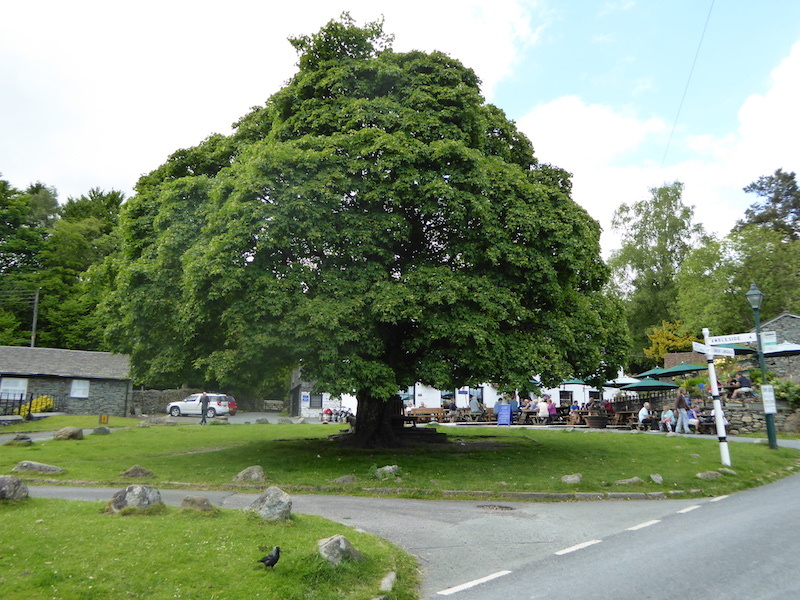 Here we’re passing The Britannia Inn at Elterwater as we set off this morning. 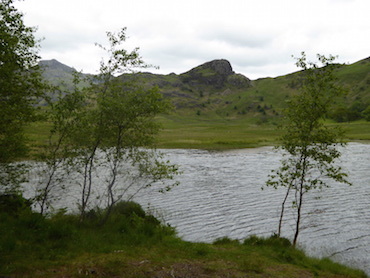 Little Langdale Tarn with Wetherlam on the left. 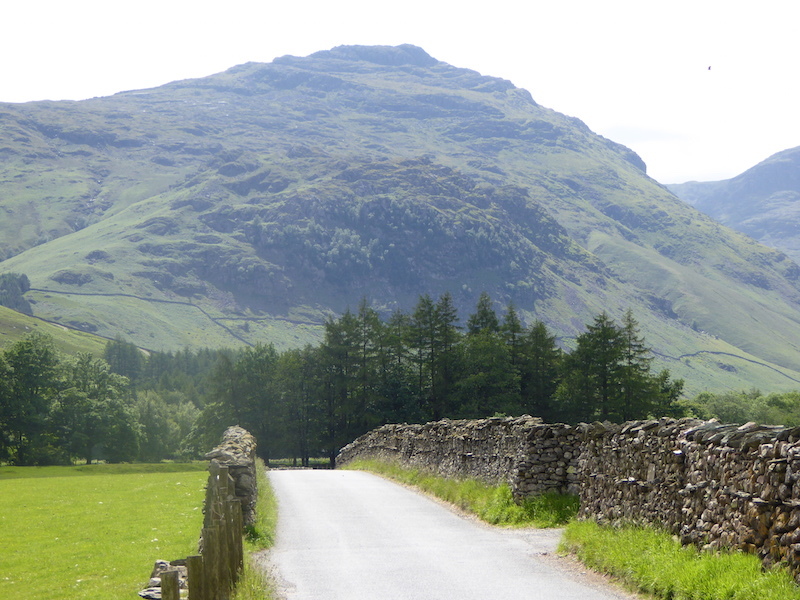 Lingmoor Fell from Little Langdale. 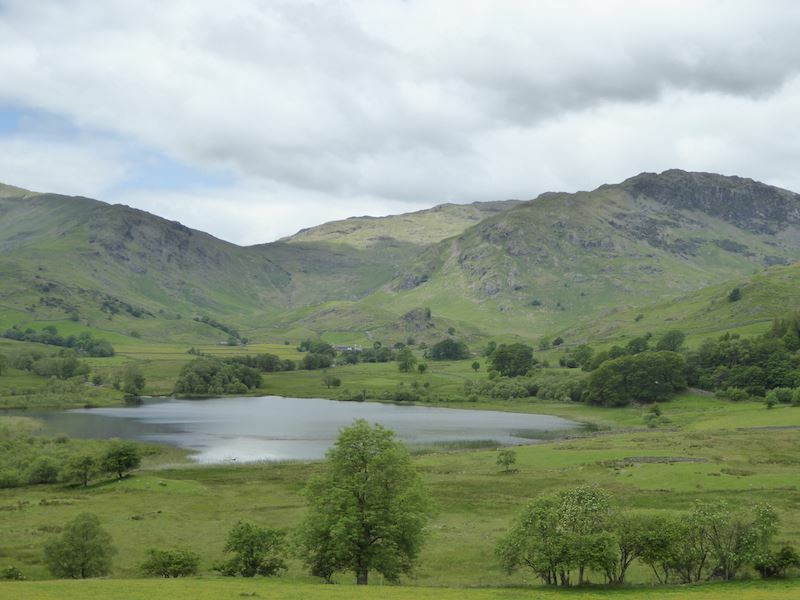 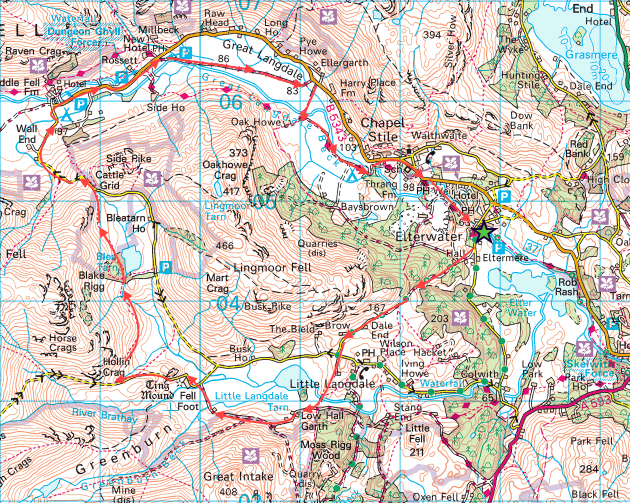 A closer look at Little Langdale Tarn and Wetherlam. 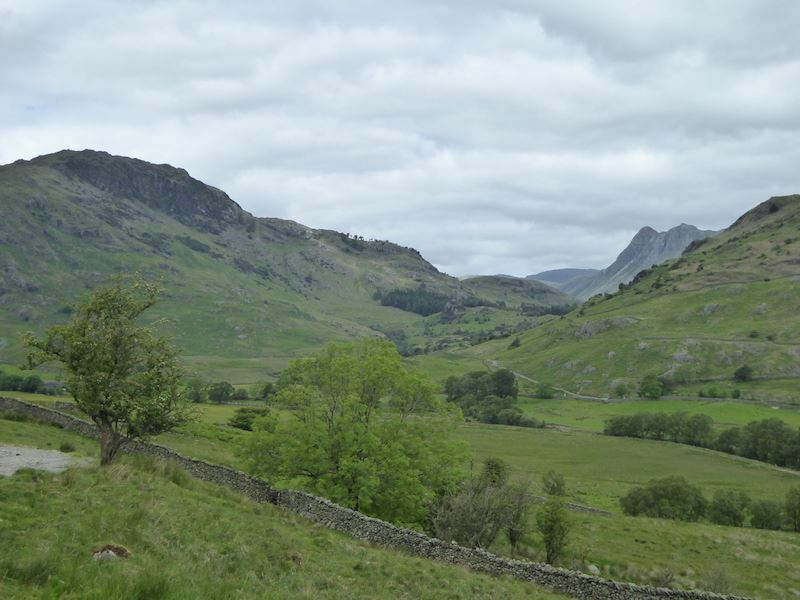 On the way down to Slater’s Bridge which can just be seen on the far left of the photo. 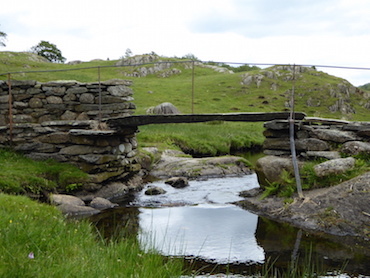 The eternally popular Slater’s Bridge. 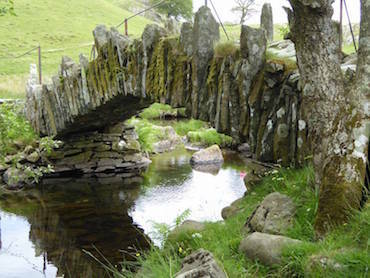 If I had a pound for every photograph that’s been taken of this bridge, I’d probably be a millionaire by now. 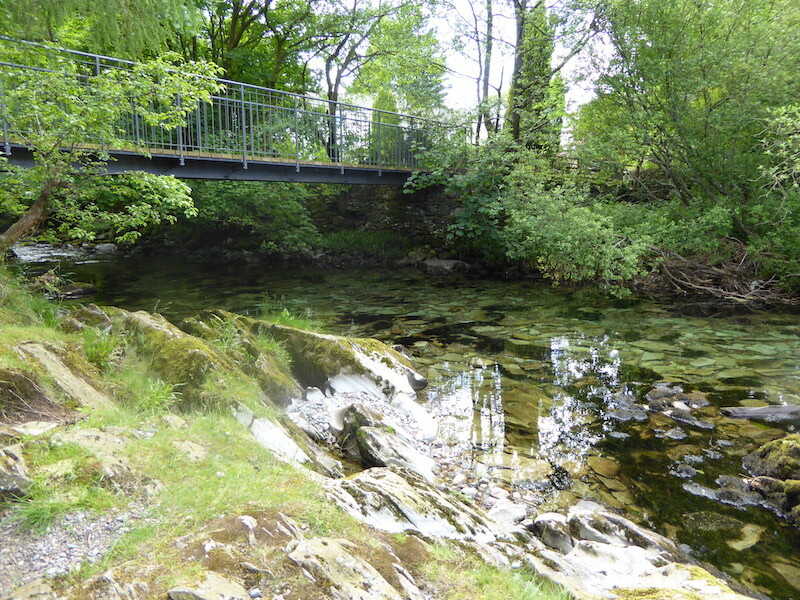 Its not obvious from these photos but there was a party of primary school children here at the time so I had to choose my moments for these next few shots …..
We crossed the bridge and continued along the path to Low Hall Garth. 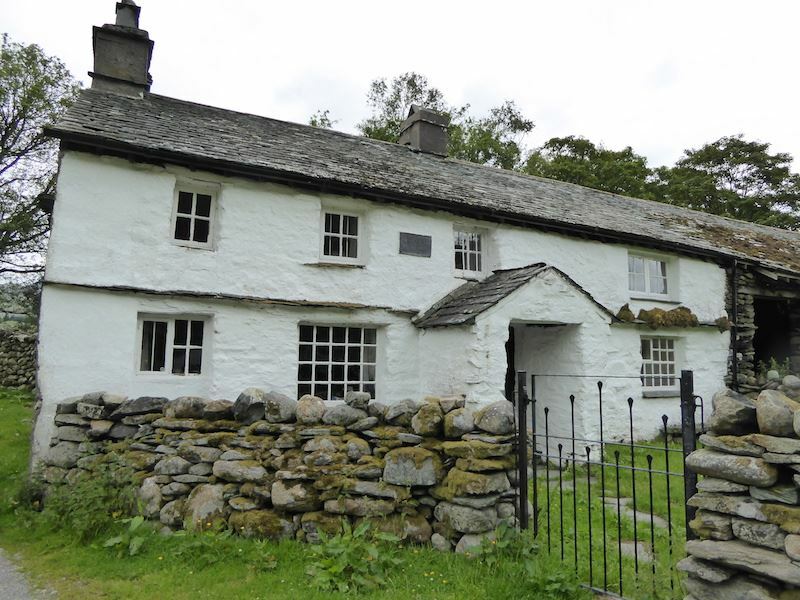 I think its a holiday cottage. 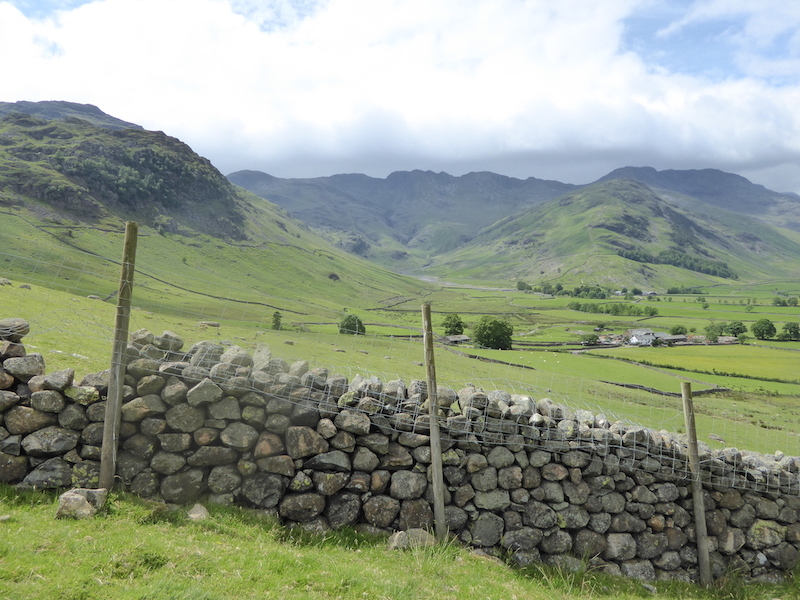 The Langdale Pikes come into view as we continue along the valley. 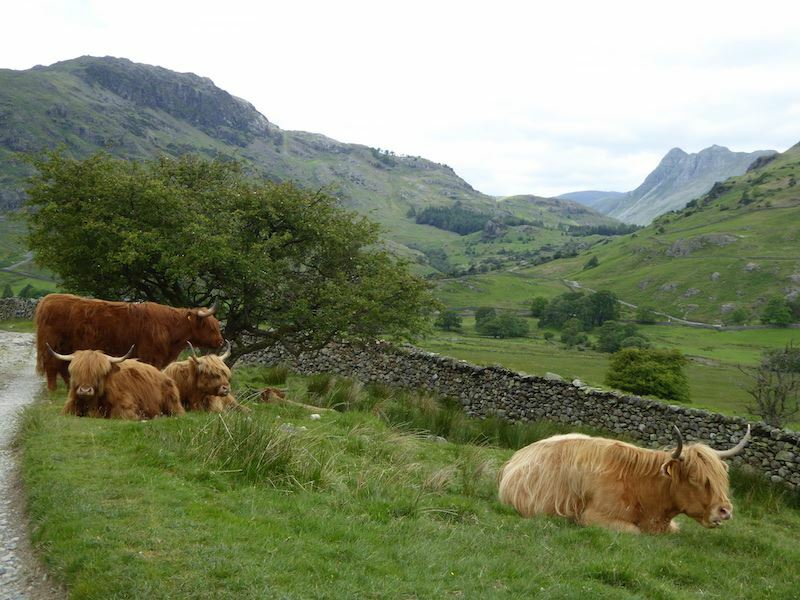 We were completely ignored by the cattle, perhaps they couldn’t see us through those long fringes. 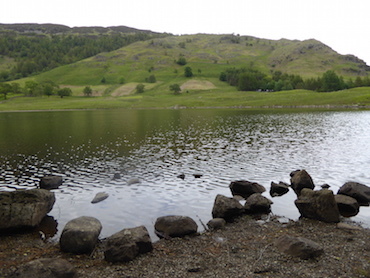 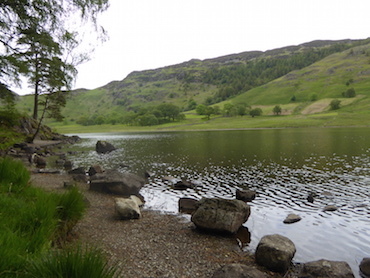 A look back at Little Langdale Tarn. 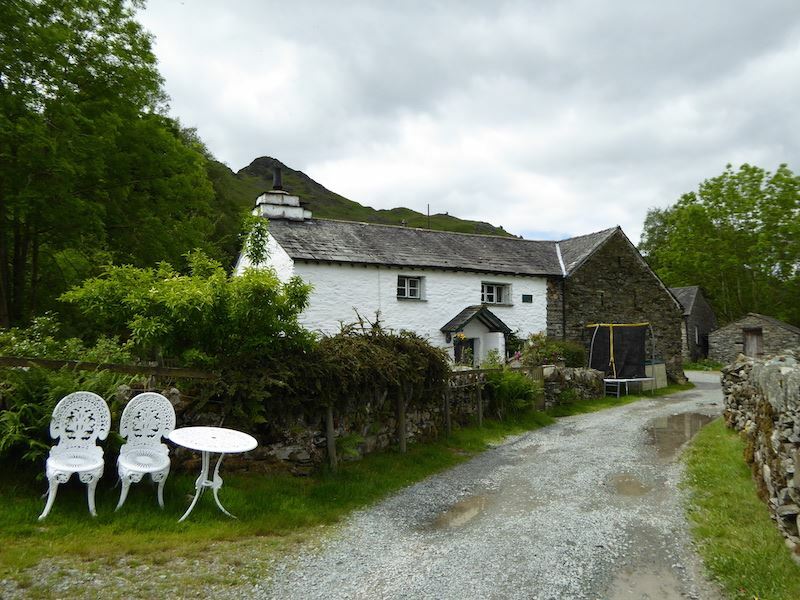 Cottage at Fell Foot. 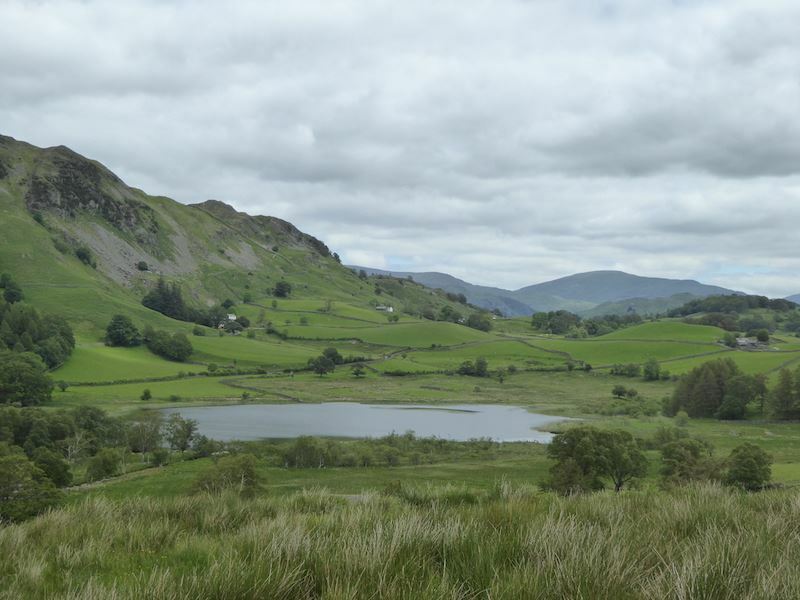 National Trust property the sign said. 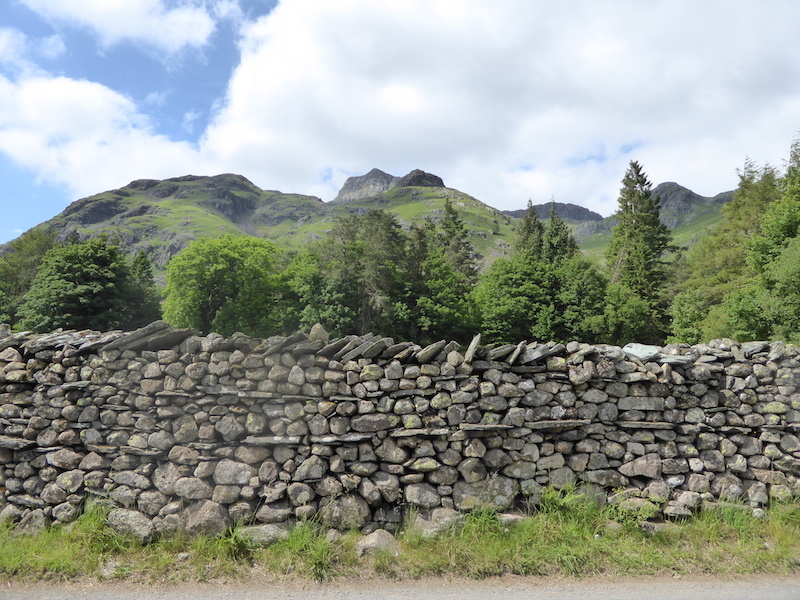 Splendid views of the Langdale Pikes along here. 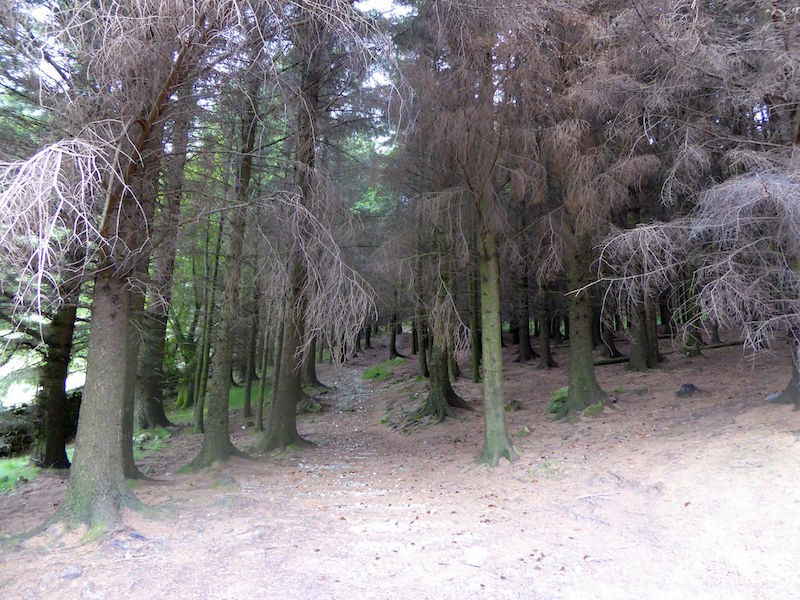 Mid June and the holiday season is in full swing apparently. 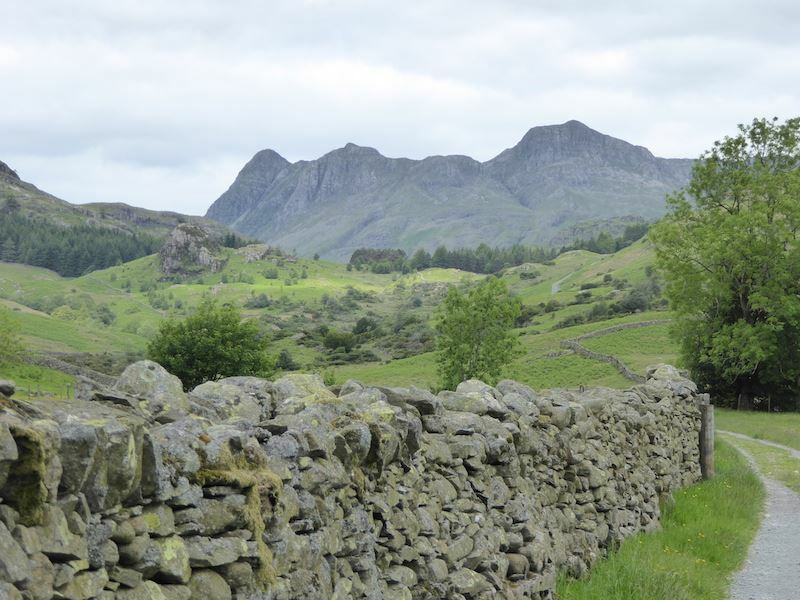 The Langdale Pikes dominate the view along Little Langdale. 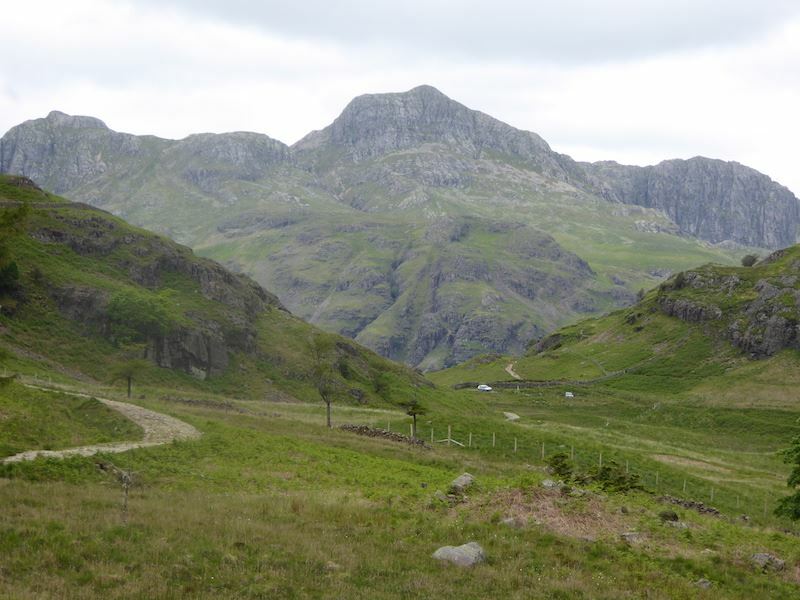 Making our way over to Blea Tarn which is in amongst those trees ahead. 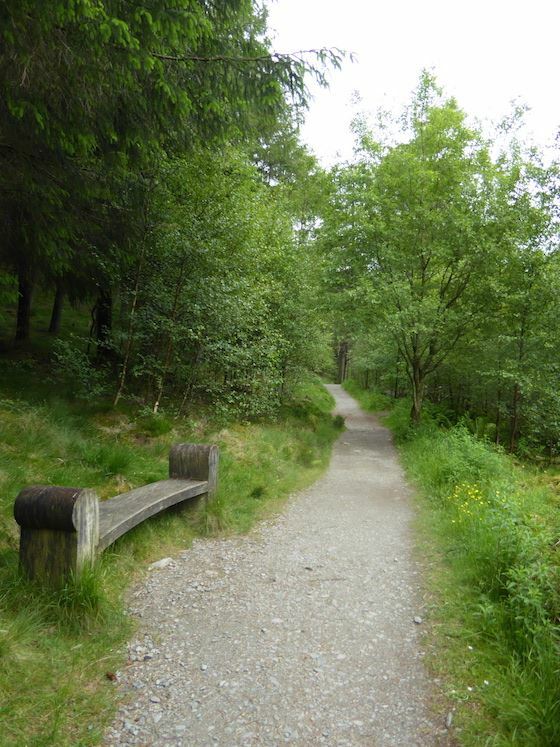 A sturdy bench to tempt the weary traveller, the temptation was resisted in favour of sitting by Blea Tarn which is just ahead. 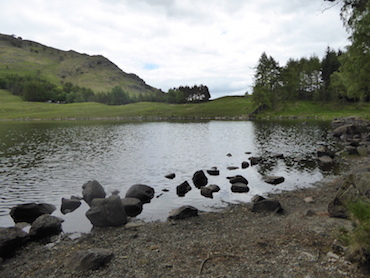 Below are some shots of Blea Tarn where we had a short break just as a bank of cloud came over and the wind got up …..
A sturdy bench to tempt the weary traveller, the temptation was resisted in favour of sitting by Blea Tarn which is just ahead. 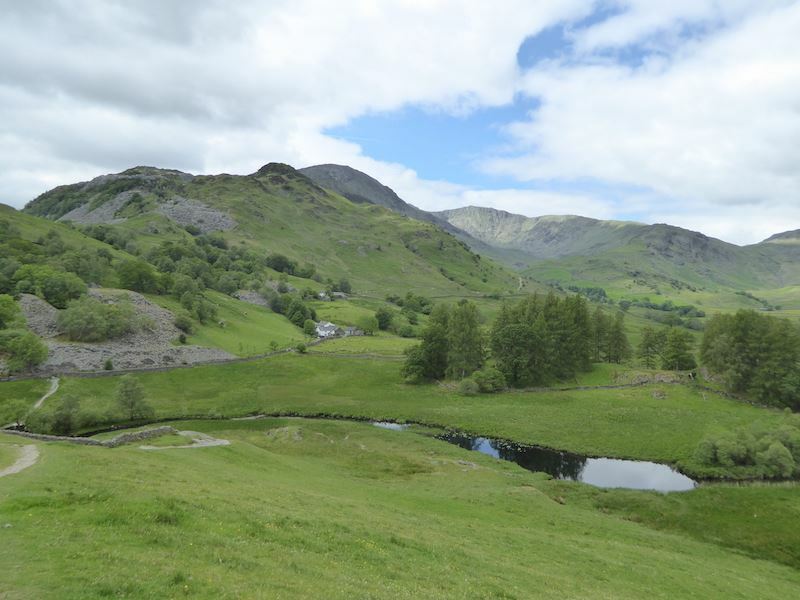 Below are some shots of Blea Tarn where we had a short break just as a bank of cloud came over and the wind got up …..
Moving on after our break with the Langdale Pikes to the left and Side Pike over on the right. 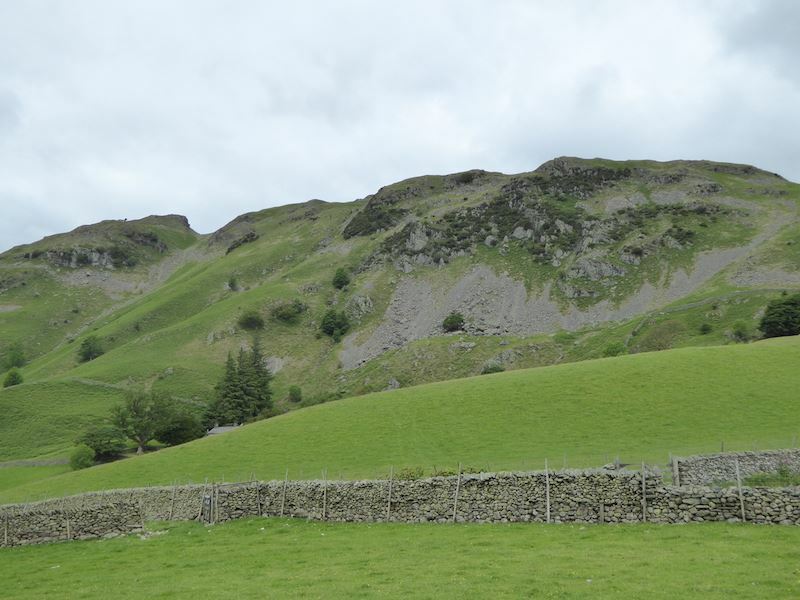 A closer view of Side Pike. 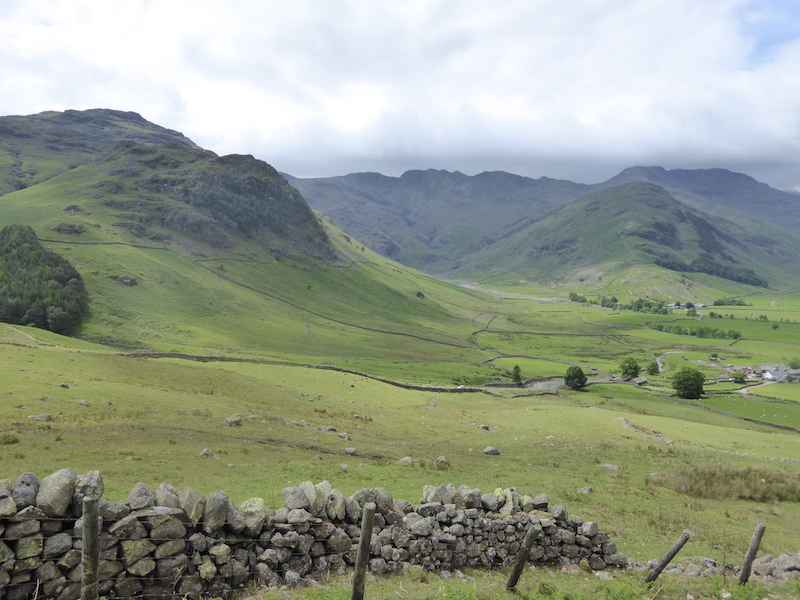 The Langdale Pikes become even more prominent as we reach the end of Little Langdale. 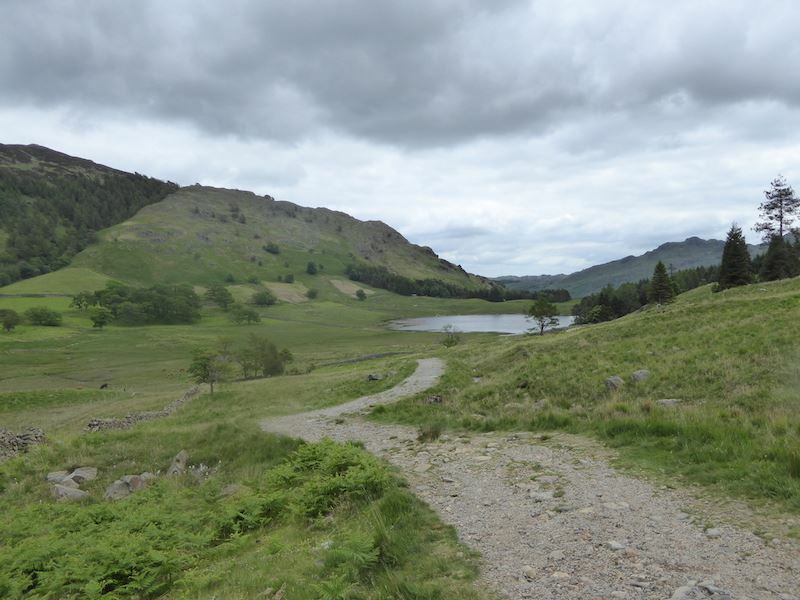 A look back at Blea Tarn as we reach the end of Little Langdale. 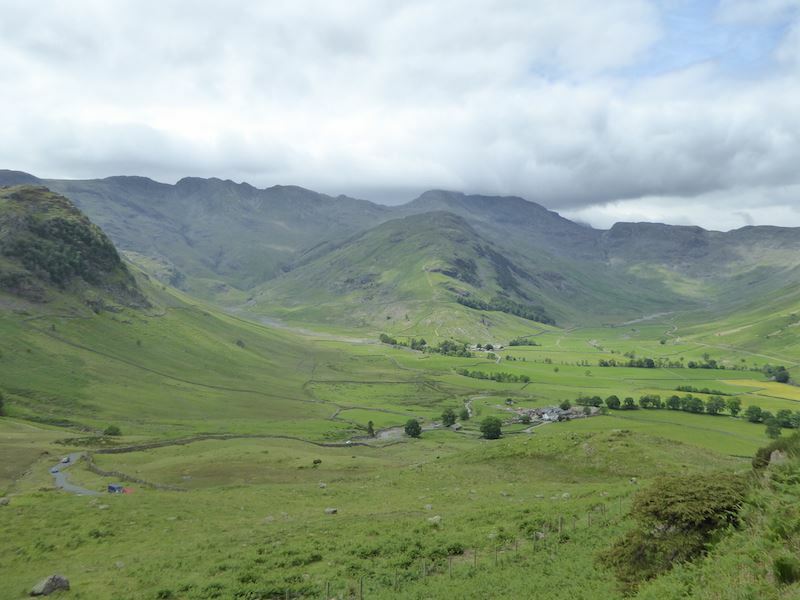 As we leave Little Langdale, to our left we see Crinkle Crags on the left skyline, Bowfell in cloud in the centre, and the familiar shape of Pike O’ Stickle over on the right. 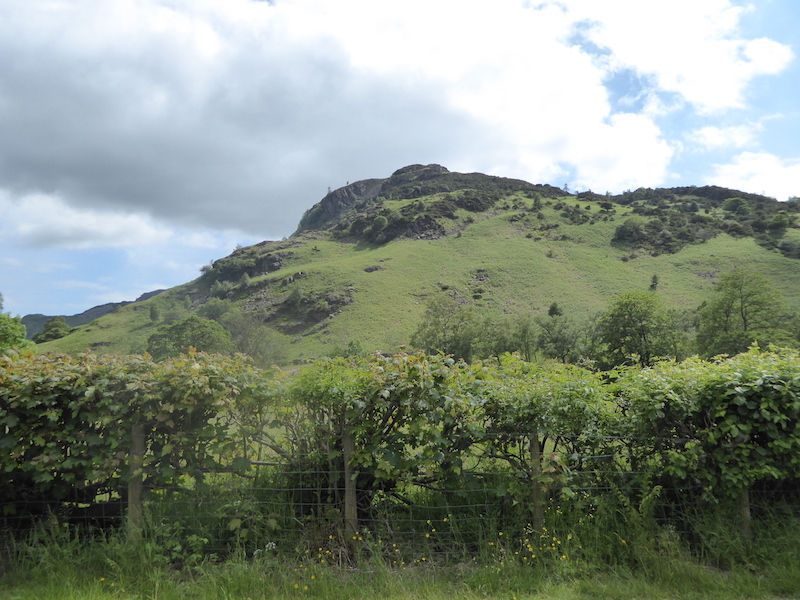 The cloud has really built up now. 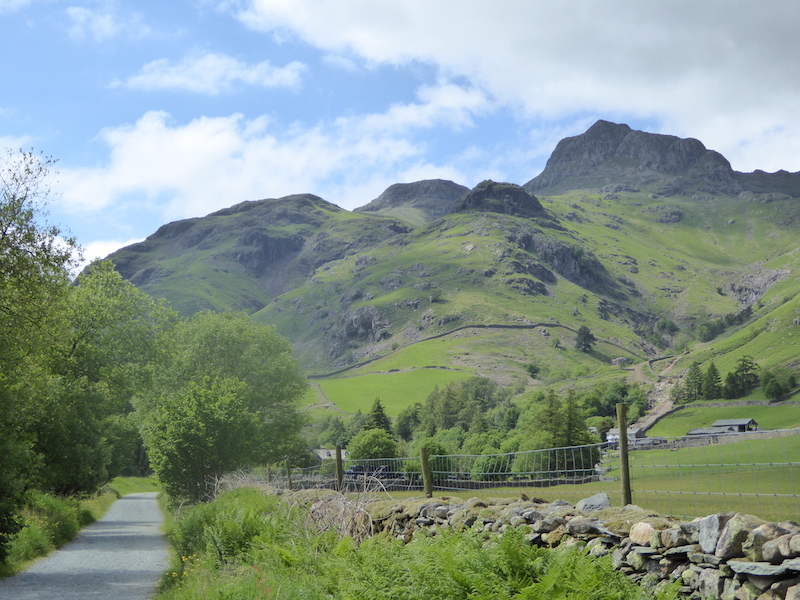 The Langdale Pikes – from left to right – Pike O’ Stickle, Loft Crag, Harrison Stickle and Pavey Ark. 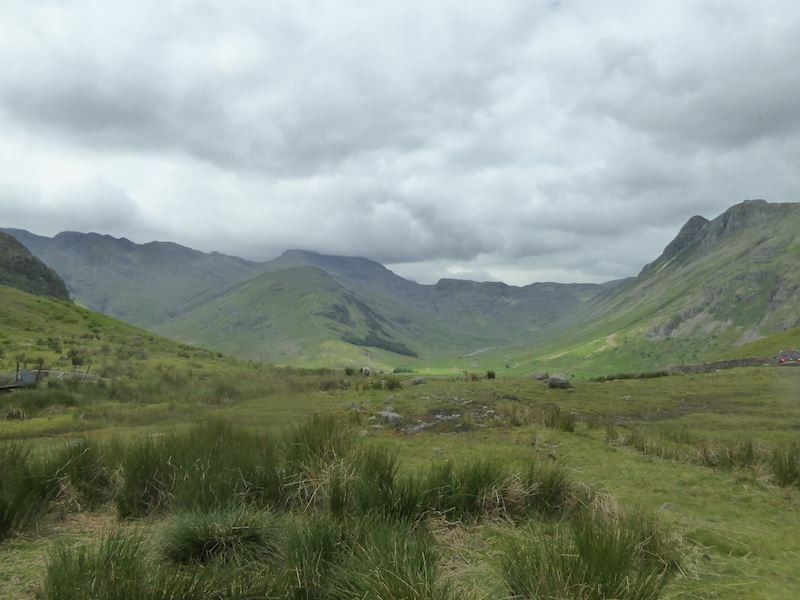 Pike O’ Blisco on the left, Crinkle Crags next and then Bowfell, still with its head in the clouds. 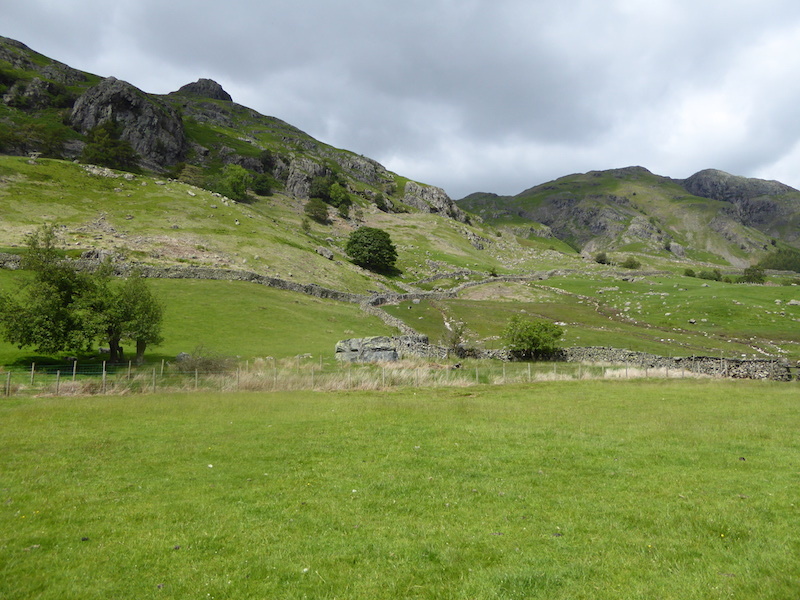 The Band, in the centre, separating the two valleys of Oxendale on the left and Mickleden on the right. 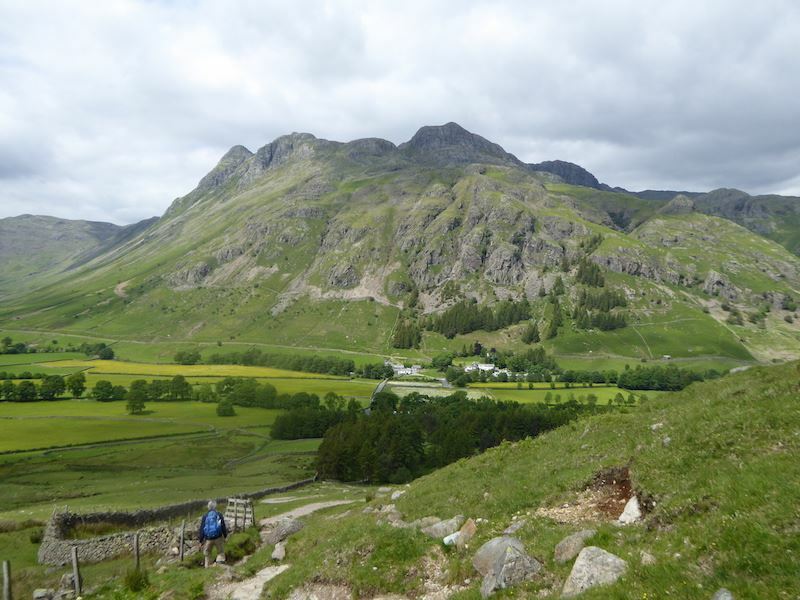 Descending to Great Langdale with the Pikes still dominating the scene. 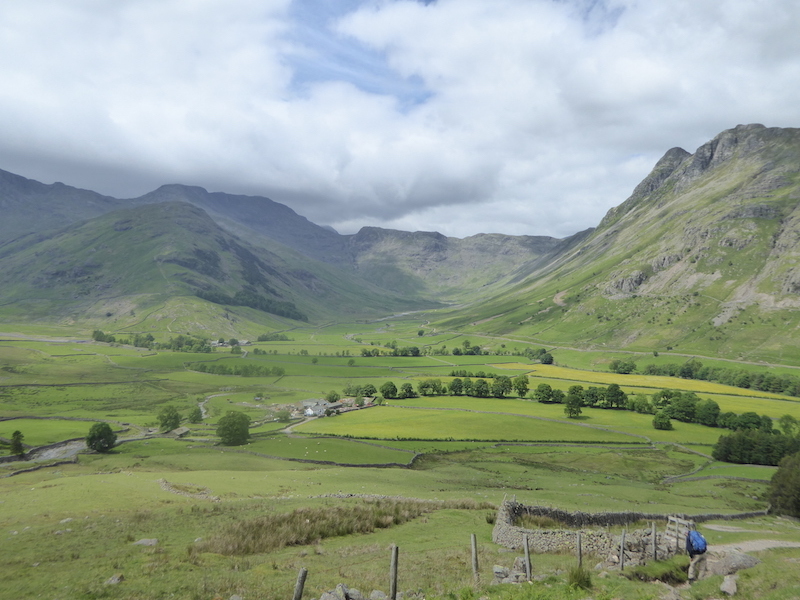 A look over into Oxendale from the descent path …..
….. and a view into Mickleden. 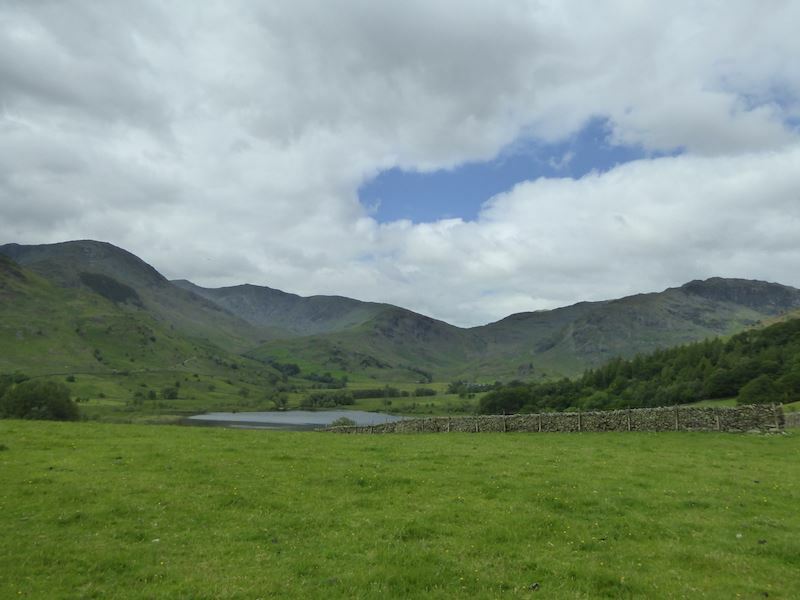 The fells above Oxendale now clear of cloud. 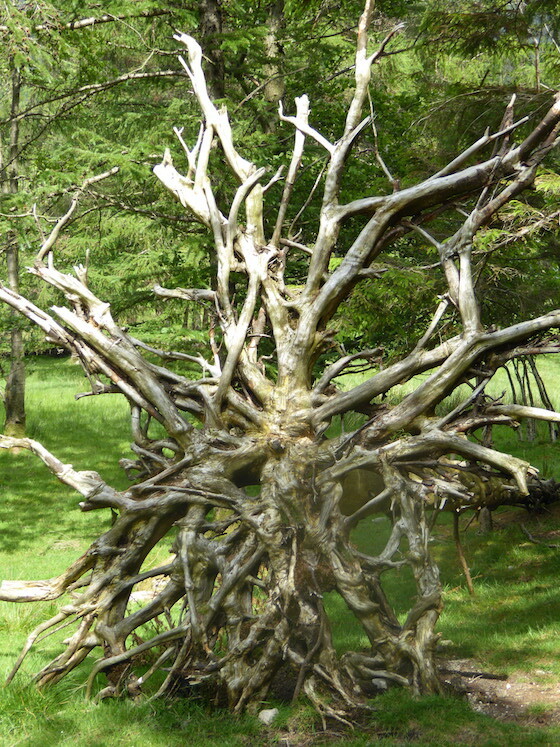 The dried roots of an upturned tree looking like a piece of modern sculpture, or my hair on a bad day. 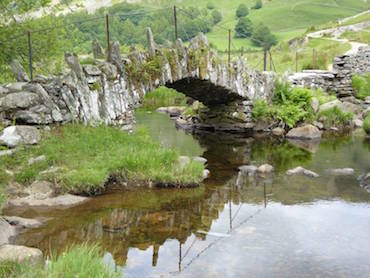 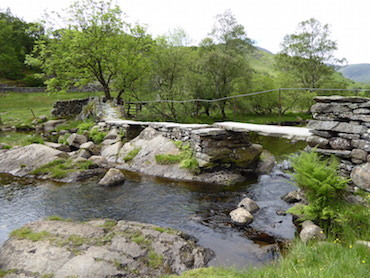 Crossing the bridge into Great Langdale and there’s no water in this section of Great Langdale Beck. 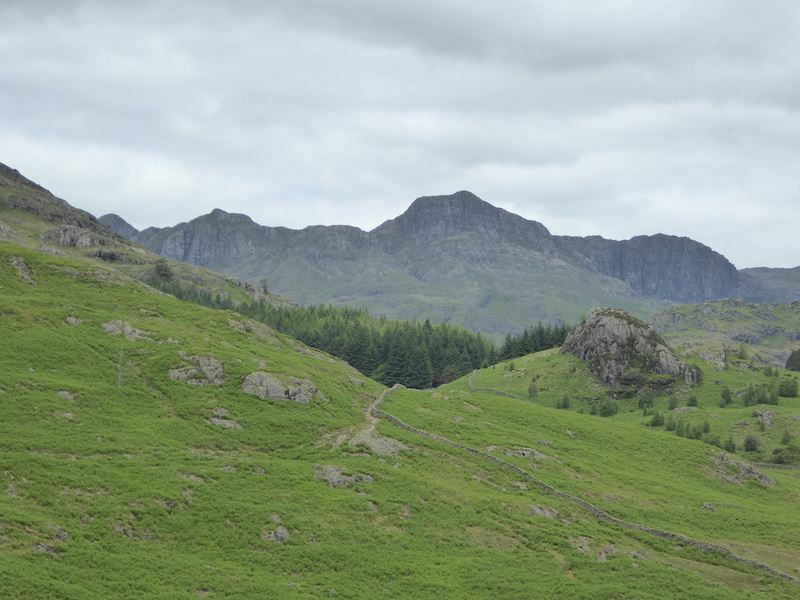 The rough crags below the Langdale Pikes from Great Langdale. 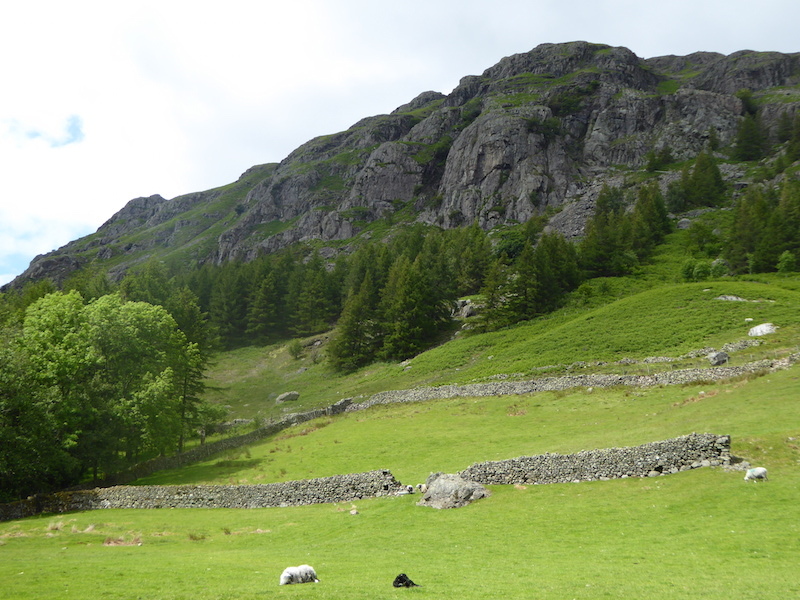 The other side of Lingmoor Fell and Side Pike from Great Langdale. 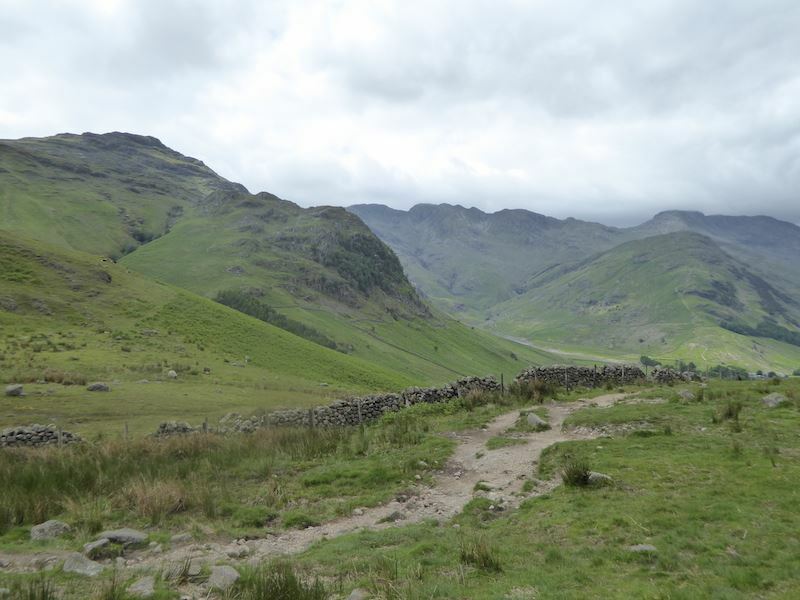 If you walked up to the top of Lingmoor Fell over there you would be looking down into Little Langdale, which, of course, we have just been walking through. 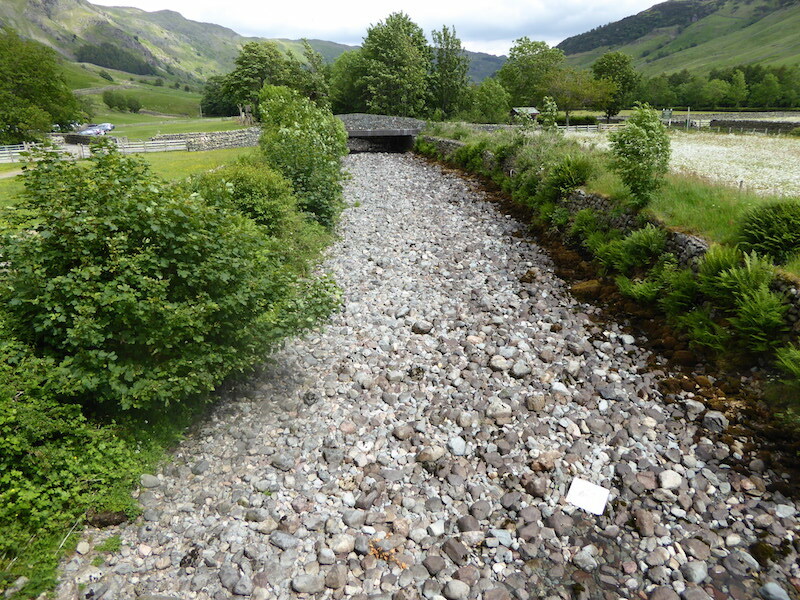 We’re much further down the valley now and still there’s no water in the beck. 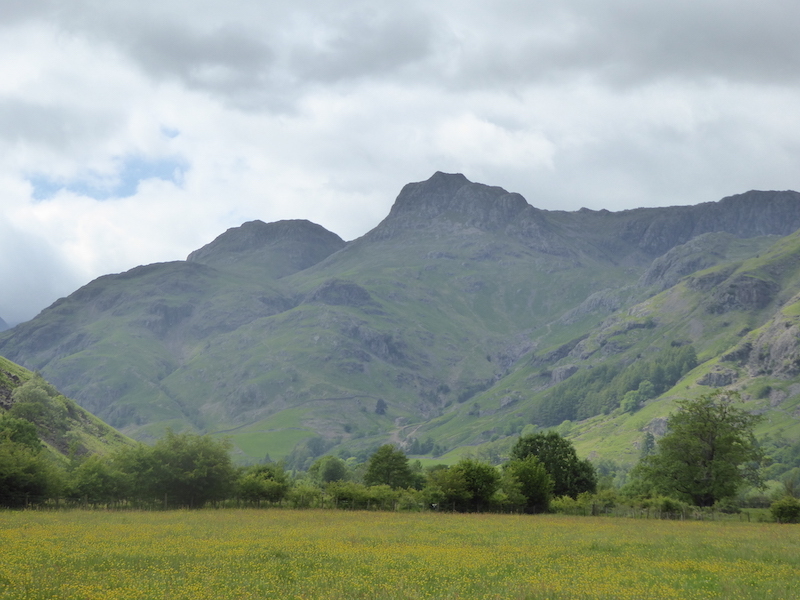 The Langdale Pikes only just visible now as we continue through Great Langdale. 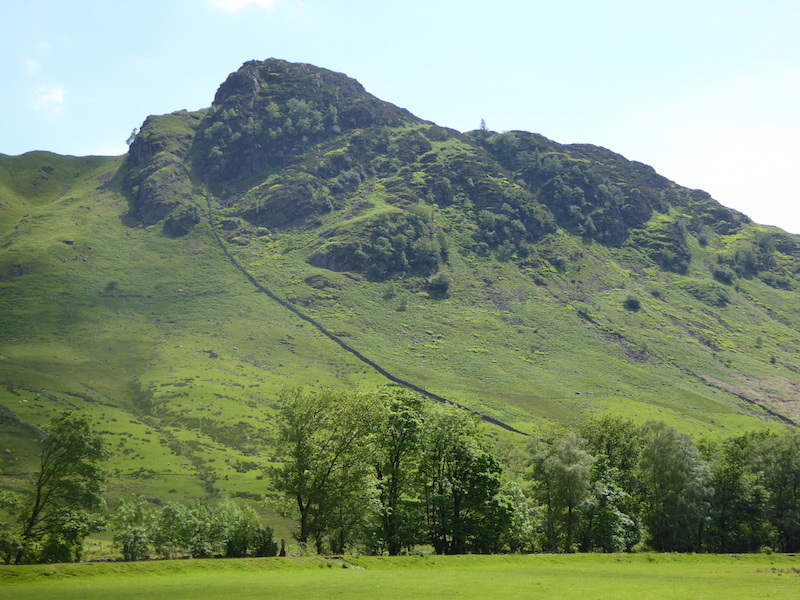 A side view of Side Pike from Great Langdale. 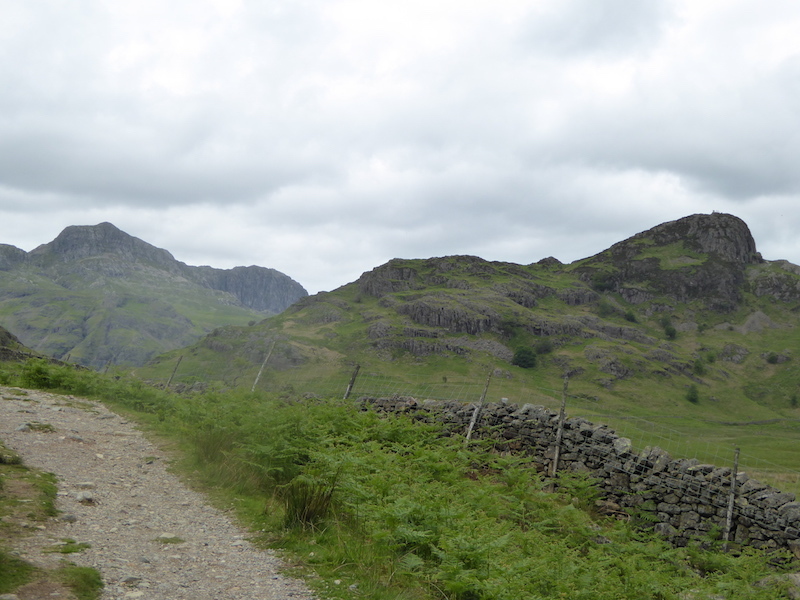 Looking back along the lane to Pike O’ Blisco. 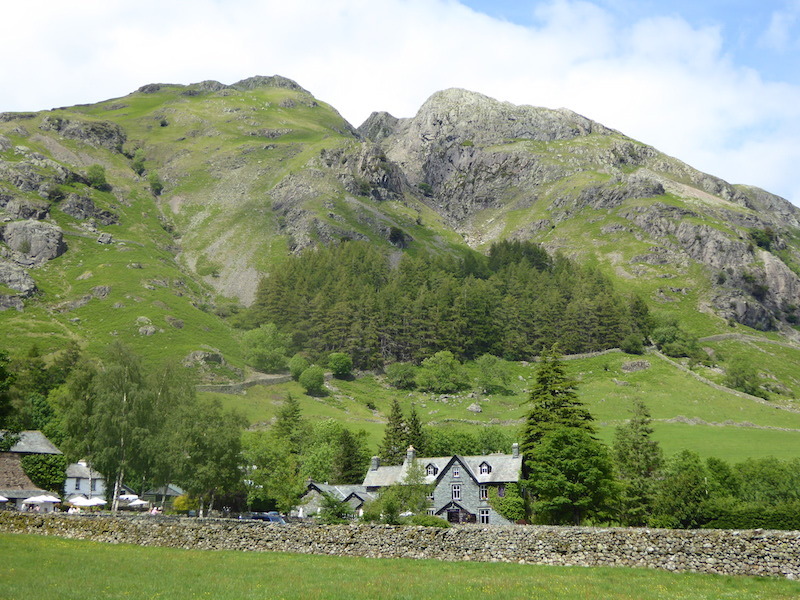 The crags along Great Langdale towering over the New Dungeon Ghyll Hotel below them. 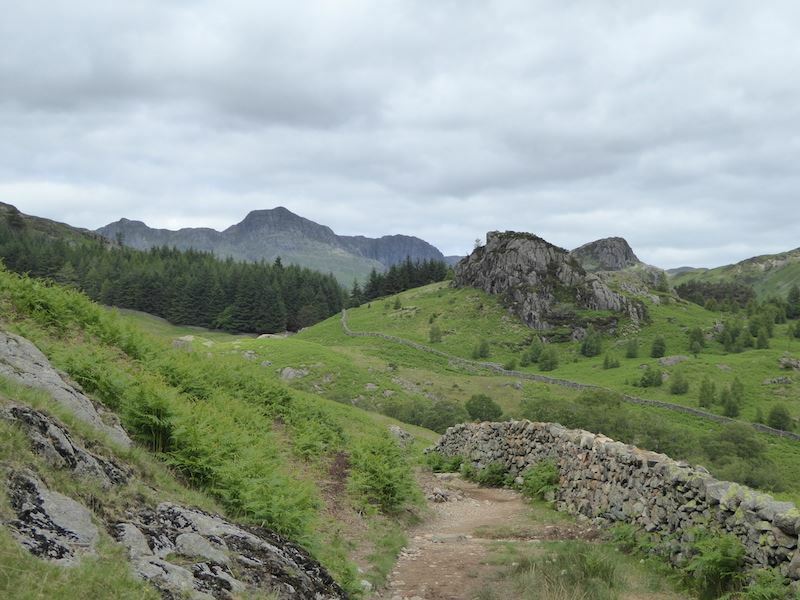 A look back at the Langdale Pikes, Harrison Stickle the most prominent. 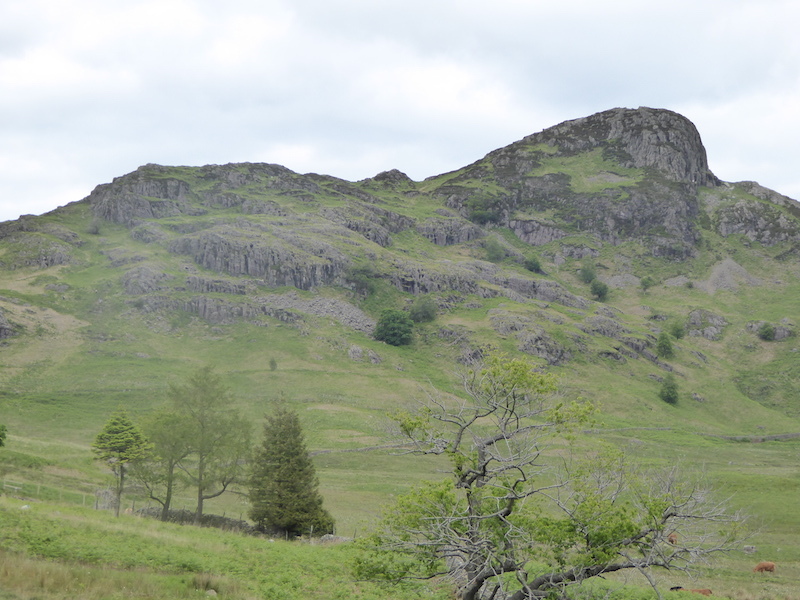 Oak Howe, I was pleased we decided not to return via the path over there as it turned out to be a very warm afternoon. 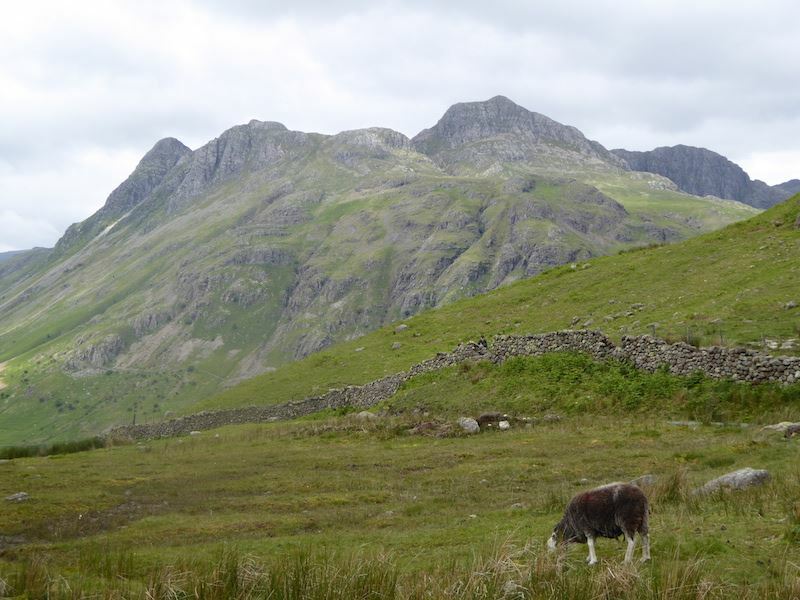 Crossing the meadow I took this close up of the Langdale Pikes. 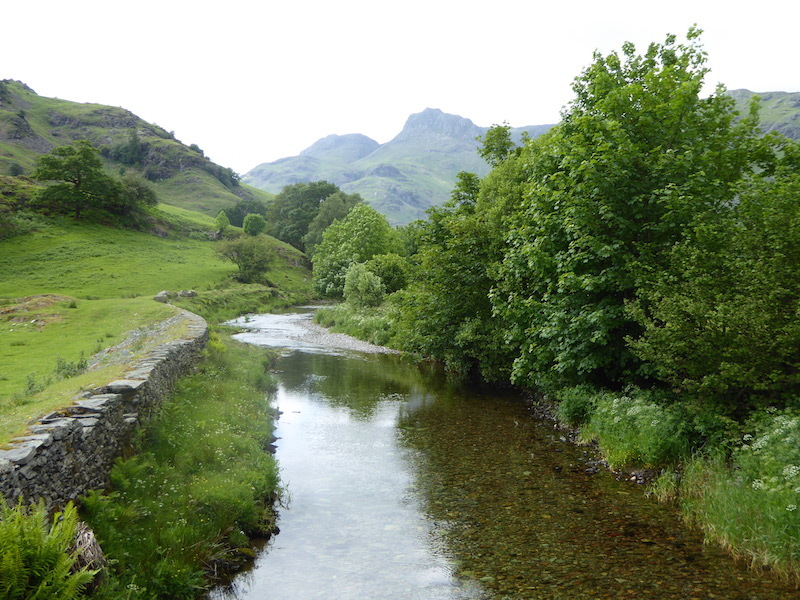 Crossing Great Langdale Beck which now has water in it, where did that come from, it was dry as a bone further up? 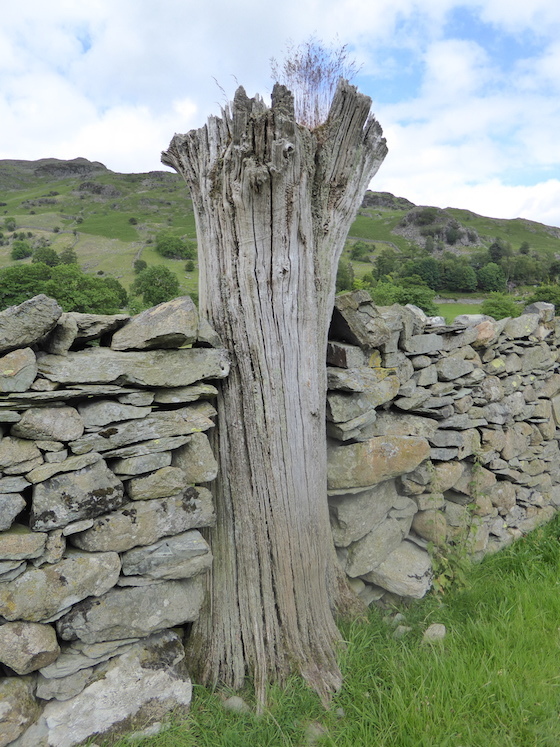 A dual purpose tree, a piece of modern sculpture with an incongruous touch provided by the grass growing out of the top, and a stanchion for the dry stone walls. 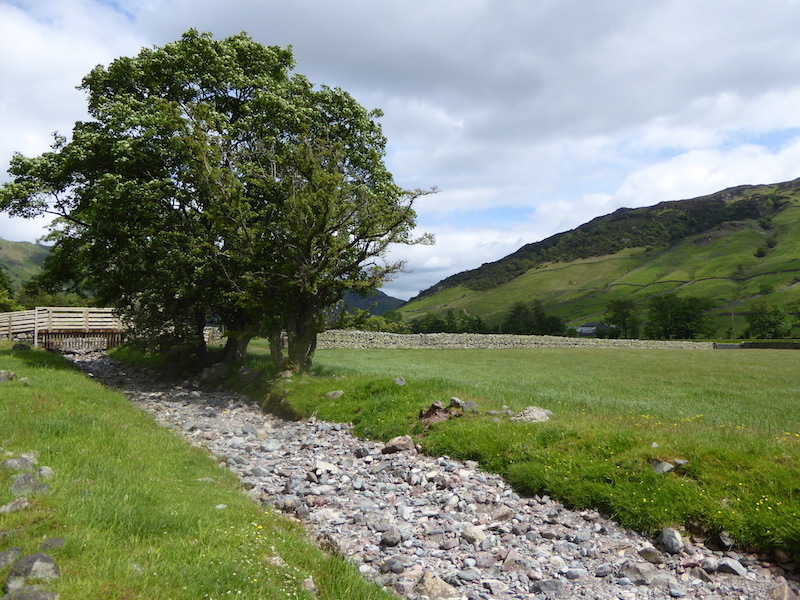 The beck flowing alongside Chapel Stile was crystal clear. 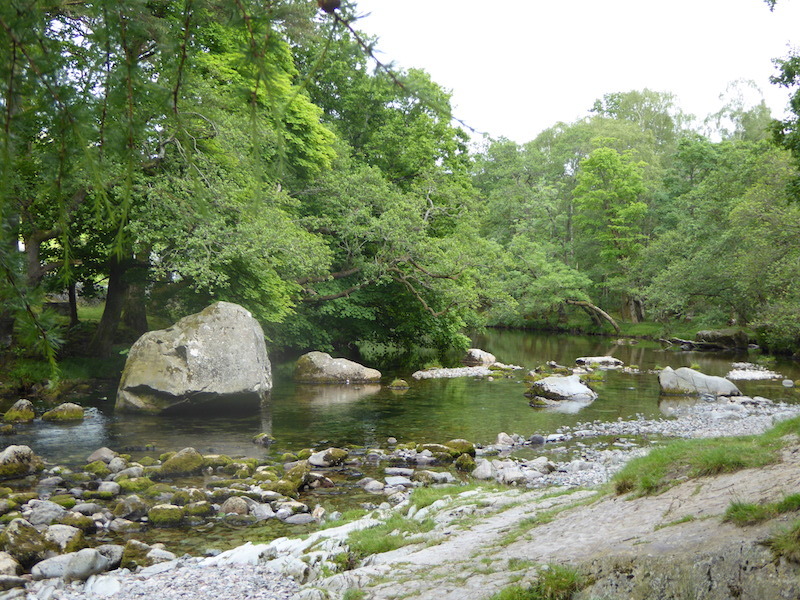 Nobody around today but this spot will be busy on a hot sunny day during the school holidays, its just perfect for picnics and paddling. 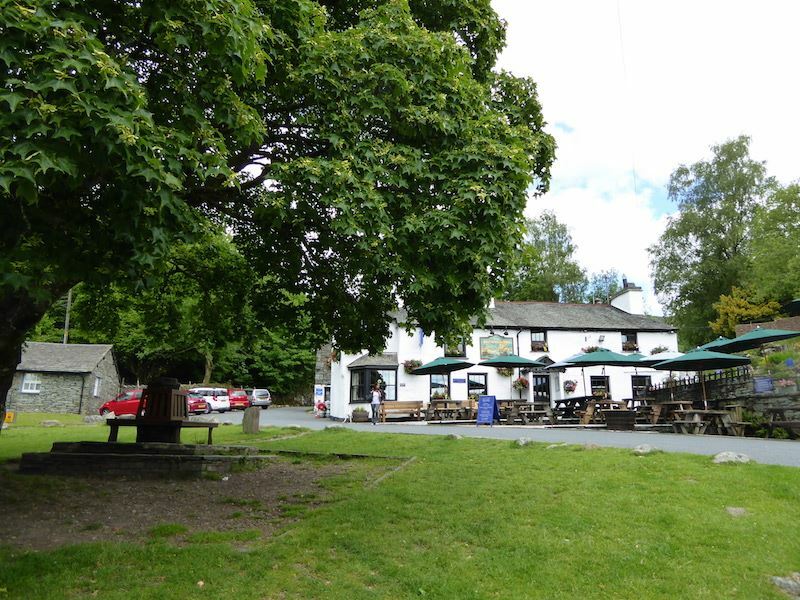 The Britannia Inn is now much busier than it was this morning. 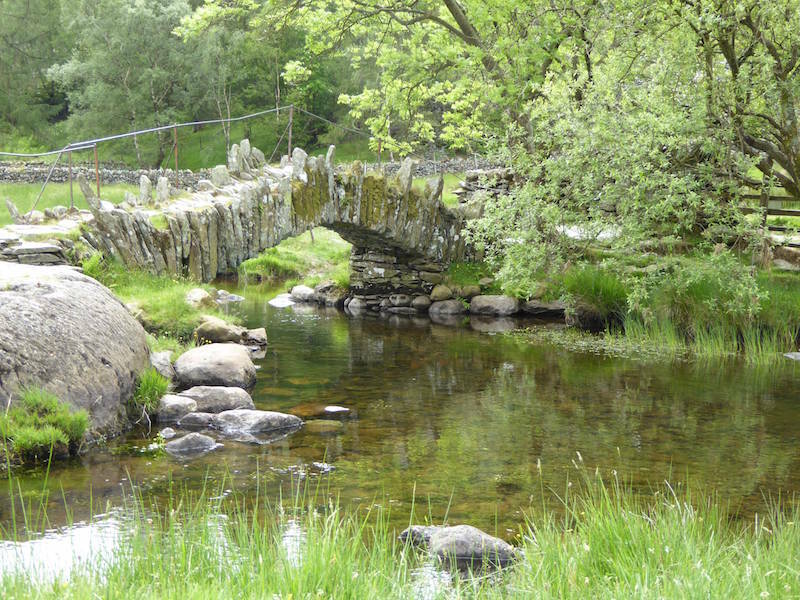 We did consider having something to eat here but we changed our minds when we looked at the prices on the menu. 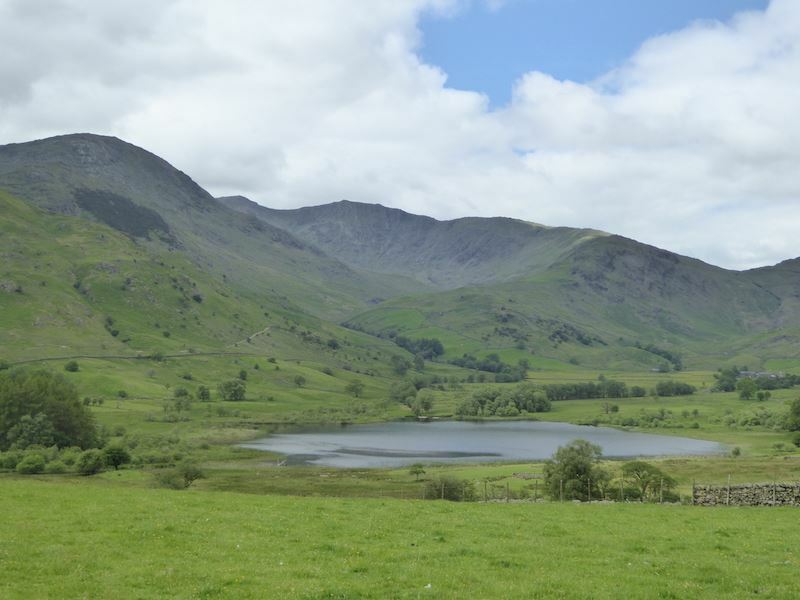 I love lasagne but I won’t pay £13.95 for a plate of it. 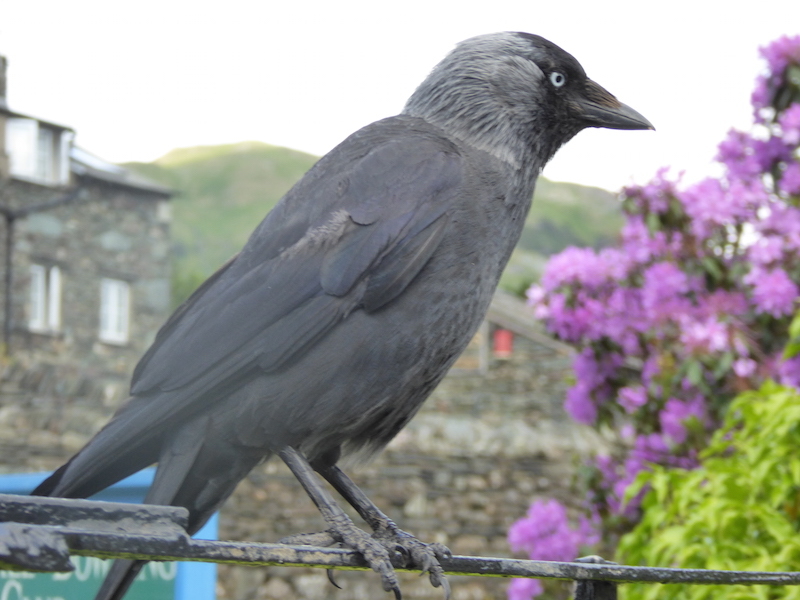 This jackdaw was not in least perturbed by my presence, it almost seemed happy to pose for a photo. 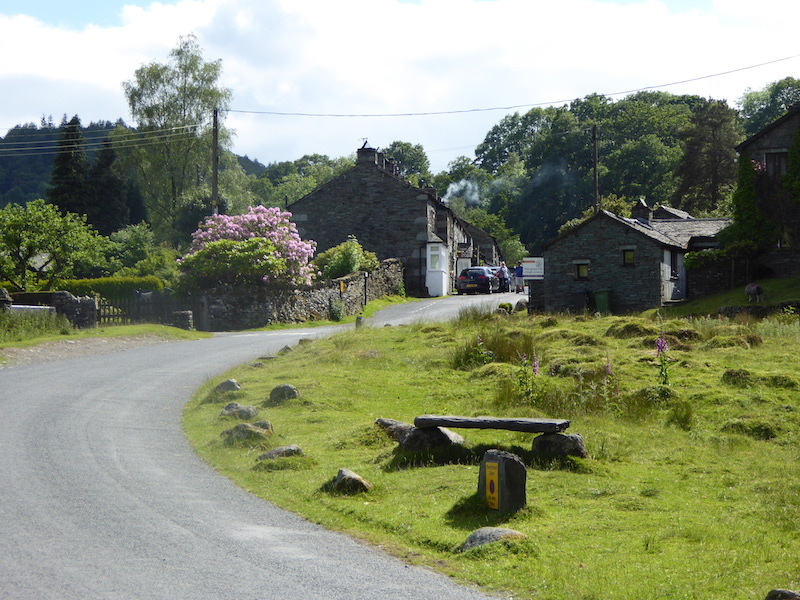 A look back at Elterwater village at the end of the walk.